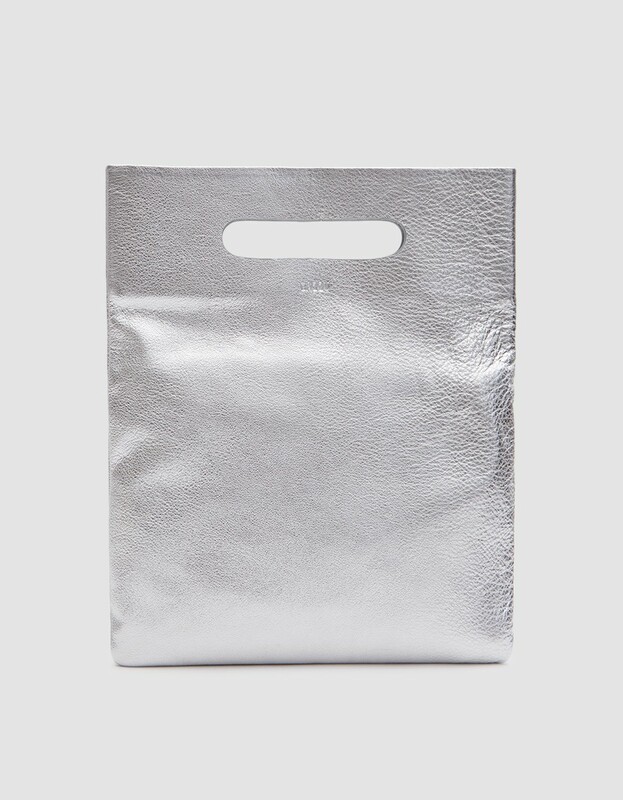 Baggu LPB Clutch in Silver. Need Supply. $120. Hello Dear Reader! When you click on the links below Poplin may receive a commission on your purchase. That's right. You support the blog without spending any extra cash. This helps keep the lights on over here AND helps you find super cool items. Thanks very much and happy holidays. However, once you've figured out your look, remember to finish off the details, too. After all, the details are what take your outfit to the next level. If you are looking for guidance on what shoes to wear, I've got you covered. The next step: let's choose a handbag. How to Choose Your Handbag for the Holiday Party. 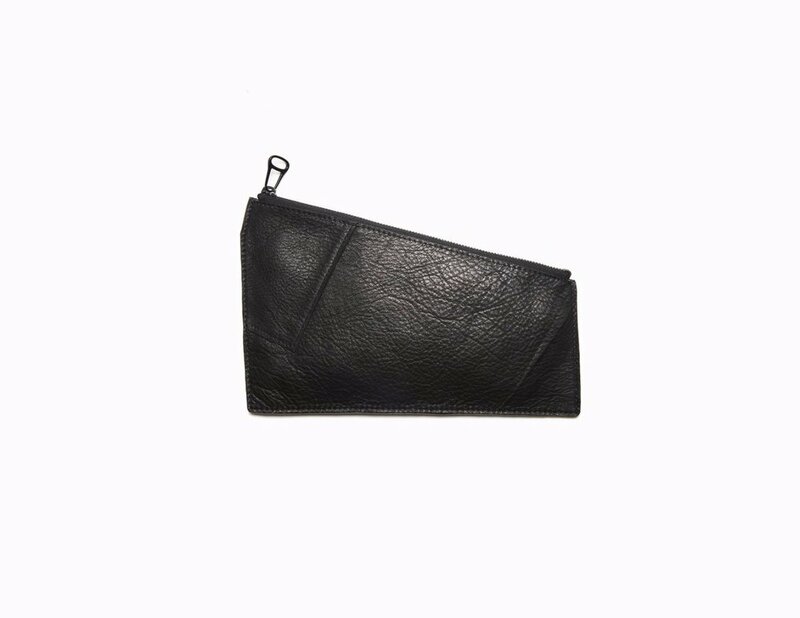 Rag & Bone Croc Embossed Leather Wristlet. Nordstrom. $325. Kate Spade Tilden Place Alek. Available in multiple colors. Kate Spade. Was: $258. Now: $79. SEQUINNED BELT BAG CLUTCH. Zara. $39. Phone-Charging Glitter Half-Moon Pouch. Banana Republic. $88. Yes. You want a showstopper. It should work beautifully with your look and clearly be yours. You also want it to be versatile. This is one night of your life and this handbag needs to work for many more such occasions. Ideally, it's going to work for a variety of events and outings. So, keep your needs in mind when shopping. A great go-to is a metallic bag. A clutch is ideal for something dressy. A strap (wristlet, cross body) is ideal for your real life. Combine a metallic clutch with a hidden or removable strap and you are home free. Most of us actually have a more defined color palette than we often realize. Look for something that fits nicely into that color story and you'll find it gets more wear. If you have a favorite pair of fun shoes that get lots of action, try a handbag of the same color, fabric or general vibe. You don't need to wear them together. The key is this: If those brocade metallic boots go with lots of pieces in your collection, a similar brocade metallic clutch will, too. Worried that you NEED to have a strap in order to hold your bag and your cocktail at a party? Your very own personal stylist can help with that. Here's how. KARACALF HAIR RING POUCH. Opening Ceremony. $350. Embroidered Hamilton Clutch. Anthropologie. $98. 2. Find a Bag that Brings you Joy. Holiday parties are special occasions. Sure, we throw around that term all the time not really digging into what those words mean. These are moments that are worth remembering. We know that before we even get there- and how often does that happen. Start the night off right with a handbag that makes you happy. The color, the print, the functionality, the way it looks in photos- all of these components are important when selecting what bag to wear. If your handbag is simply an annoying item that can't fit your lipstick, phone and ID, it's not going to bring you joy, my Dear. MM6 MAISON MARGIELA croc belted clutch. The Dreslyn. $645. Augustina Foldover Clutch. Available in multiple colors. Anthropologie. $48. Hobo Raine Leather & Genuine Calf Hair Clutch. Nordstrom. $208. 3. Plan to Coordinate in an Unexpected Way. Black bag, black shoes. Sure. That totally works. And if that's what you've got 15 minutes before you head out the door, that's going to be your best solution. But, if you've got more time to ruminate on this endeavor, think outside of the box a bit. I have always been a huge fan of coordinating your coat and your handbag, especially if you have a colored coat. Think green coat: green bag. This makes your life easier because if something matches your coat, it will automatically match your bag. Alternatively, opt for a color that isn't in your outfit at all, but is a striking contrast to your look. A bright orange bag with a winter white suit, as an example. There are SO many detailed bags that feel like one of a kind pieces right now. Choose one and let your bag be the focal point of your outfit. Or, think about a neutral bag that doesn't feel neutral at all: burgundy, forest or army green, camel, white, winter white or navy. If you wear bright colors regularly, royal blue could be your unexpected neutral. Remember this: the stem never clashes with the flower. Green goes with everything. The sky and the ocean coordinate with every color in nature. Translation: Blues and greens are neutrals. The goal is to find the right one for you. Armalee GEOMETRIC POUCH BLACK. Pipe + Row. $49. 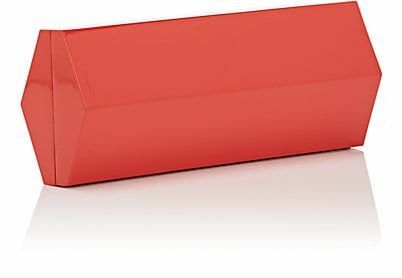 BENEDETTA BRUZZICHES Princess perspex jewel clutch. Far Fetch. Was: $840. Now: $420. 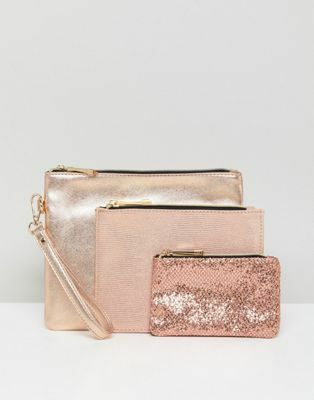 Oasis Glitter And Metallic Pouches. ASOS. $40. 4. Make it Work with your Budget. Crushing. I know. BUT, there are SO many ways to do that. Here are some of my favs: borrow a bag from a friend, rent one, shop at the Rack, Barney's Warehouse or look for sales (especially this time of year), use something you have in an unexpected way. Another option: buy a bag that you know you'll use for other purposes so the investment will pay off. Remember, it doesn't need to be a simple black or brown bag to be versatile. An eye catching bag can be your signature piece. This means that you can use it everyday, so feel empowered to get one that you adore. LEE SAVAGE Infinite Space Minaudière. Barneys Warehouse. Was: $2,095. Now: $835. 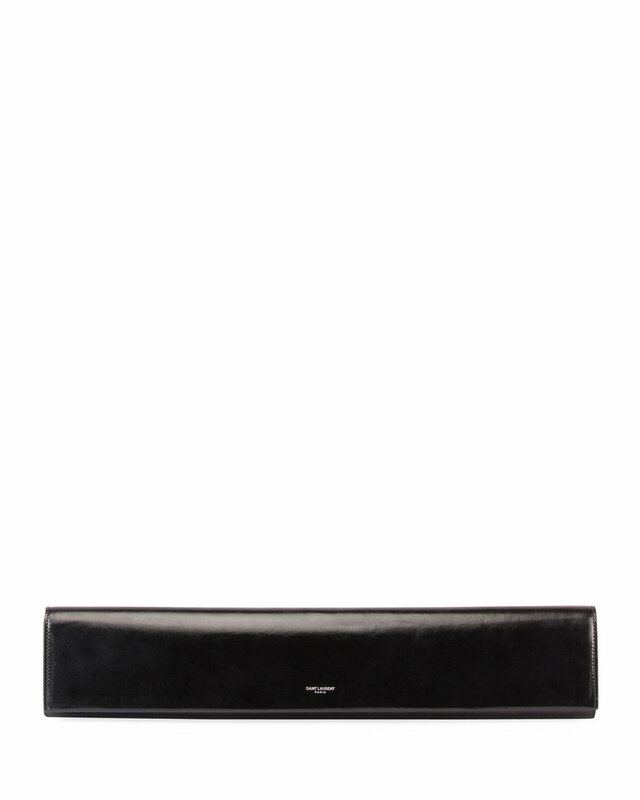 Saint Laurent Fetiche Exaggerated East-West Leather Clutch Bag. Neiman Marcus. $1,550. JIMMY CHOO Jimmy Choo Tux Bicolor Metallic Embossed Watersnake Clutch. Was: $1,450. Now: $577. If you are owning the room with an eye show stopping dress, the last thing you want is a hum drum leather cross body bag to seal the deal. Make sure your bag feel as luxurious as your outfit- or more. A sequin bag works great at a party and can also be fun with denim on a night out. These bold pieces don't need to sit in your closet until another "special occasion." Every day that we are alive is a special occasion.